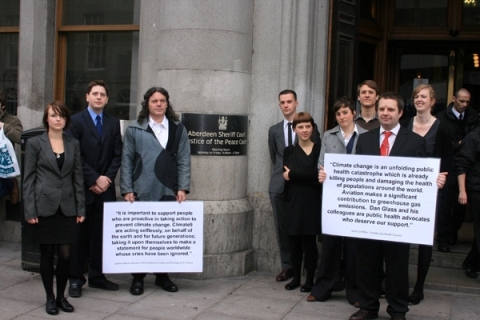 The Climate9 defence committee are incorporate a wide group of organisations and individuals who support the actions of anti-aviation campaigners who took direct action against airport expansion in Aberdeen in March 2009. These 9 activists now face a court case which could get them years in prison. This morning, they have become defendants in the most significant UK climate trial since the failure of the Copenhagen talks began in Aberdeen Sheriff’s court. Nine defendants from Plane Stupid Scotland will face charges of Breach of the Peace and Vandalism after closing down Aberdeen Airport in March 2009.Â The group intend to take the battle for climate justice from the court of public opinion to the court of law in Scotland. They plan toÂ highlight the social and environmental impacts of expanding the airport which they argue will mainly benefit the profits of a proposed luxury hotel and golf complex owned by business tycoon Donald Trump. Interest has been building around the case since Climate 9 public campaigns were launched in Aberdeen, Edinburgh and London, which have drawn global and local support for the group and helped forge alliances with social justice campaigners and racial justice movements. 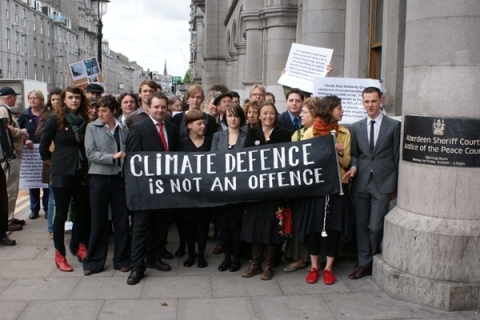 The defendants are pleading not guilty on the grounds that their actions were to prevent the larger crime of runaway climate change and have assembled a witness list of world-renowned experts in climate related fields including public health consultant Jenny Griffiths and Geoff Meaden, who contributed to the successful Kingsnorth six defence as a flooding and mapping expert. The defendants were joined outside court by around 50 friends, families and supporters.